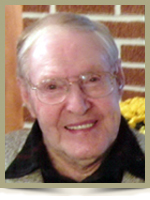 Melanson- Roger Frederick, 93, of Mill Village, Queens County, passed away peacefully at home on Friday, December 14th, 2012. Oldest son of Alexander and Cassie (Boland) Melanson, Rod was born in Bangs Falls, N. S. on December 1st, 1919. A veteran of World War II, he was a gunner in the 88th Light Artillery, Royal Canadian Army. He graduated from the Nova Scotia Land Survey Institute following his military service and was a long time employee of Bowater Mersey Paper Company where he worked as a land surveyor in the Woodlands Department. He was an avid reader, gardener and nature lover who had an enduring passion for music and singing. Throughout his life, he was active in various sports. He was a past member of the Liverpool Curling Club, Royal Canadian Legion, Branch #38 and the Mill Village Volunteer Fire Department. Rod also served on numerous local committees and groups over the years. He is survived by his children Gayle (Dave) Doncaster, Robert (Mary Ann), Anne (Terry) Murphy and Alex (Joy), nine grandchildren, six great grandchildren, and his six special caregivers. In addition to his parents, he is predeceased by his wife of sixty-one years, Estella (Newell), sisters Sandra (Seamone), Muriel (DesRosiers), Madge (MacKinnon) and Merlene Melanson. Brothers Robert, Russell, Rex and Royce. Please accept my deepest sympathy in the lost of your Dad. Having just lost my Dad, I can empathize, but know that he is always with you in your memories. As the days go by, tears will turn to smiles as you share Rod’s wonderful life with family and friends. He is watching; make him proud. Sing! I was saddened to read about Rogers passing. I always enjoyed my visits will him and Estelle.They will be missed by everyone that was in their lives. JOY &FAMILY ,so sorry for your loss .thinking of you at this sad time . So sorry to hear of your Dads passing. Our thought are with you at this time. Our thought are with you during this sad time. You will always have good memories of Rod to keep you going. To the Melanson Family I send my deepest condolences.His memory will surely live on in the hearts of his family and friends.Only time and knowing he had a long life will do the healing. We were so sorry to hear of Rod’s passing.I will always remember the stories he used to tell me while visiting him,while working.He will be missed by everyone who had the pleasure to know him.Our thoughts and prayers are with you all at this time.He was certainly a great person as was Estelle. So sorry for your loss. Thinking of you during this difficult time. Take care. So sorry to her of your loss, you are in our thoughts and prayers. Gayle, Bob, Anne and Alex: I was sorry to hear of your loss. Thinking of you all at this sad time. Hold on dearly to the memories. You are all in my thoughts and prayers. To the Melanson family .Sorry to hear of your loss. I knew Roger for a good many years . Always had a chat with him . Great guy . Sincere sympathy . Brenda Lawrence . Thinking of you all and hoping you have all the best memories of your father Alex..! So sorry for your loss. Dear Gayle, Bobby, Anne & Alex: So sorry to hear of your loss, We are thinking of you at this most difficult time. May you find comfort in your wonderful memories. Take care. Sorry to hear about Rod’s passing. He was a great guy. Always remembered when he surveyed my woodland for me. Stepping over windfalls like a crane. I couldn’t keep up and he was nearly 80 then. Please accept our condolences on the loss of your loved one. Our thoughts and prayers are with you at this most difficult time. Just want to let Anne, Bobby and family know I was saddened to hear of your fathers passing. Many fond memories of time spent in Mill Village, (many years ago!). Undecided what to do after high school, it was several conversations with Rod that made me decide to take up land surveying as a career…last June I retired from NS Department of Natural Resources after 35 years in the Survey Department. So glad we had those talks! You are all in my thoughts and prayers. Take Care. On behalf of the Association of Nova Scotia Land Surveyors, may I express our sympathy to family and friends on Roger’s passing. He recieved his commission to practice land surveying in 1954 and was assigned # 141 but had been working on obtaining his commission since 1947. His legacy of boundary lines and corner markers will live on. Melanson Family: I met Roger in 1957 when I was a student at the Land Survey School. As part of my training I spent two weeks with the Mersey Paper Company as part of a survey crew under Roger. It was an enjoyable experience. I kept in touch at land survey conventions and meetings. He was a true gentleman and I am sure he will be greatly missed. My condolences to all the family.